Any kind of soup is hot favorite at my home. Especially my son is crazy about soups. Sometimes we go to Chinese or Thai restaurant just to have soups for him. 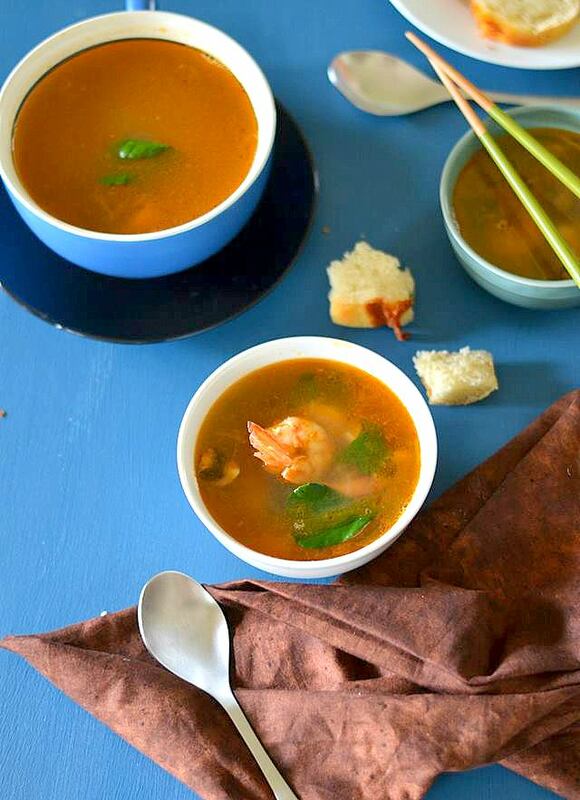 This is one of our favorite soups in Thai restaurant. Recently we had this in a party at one of our family friend’s home. So I thought why I don’t try myself! Then I took the recipe from her and also checked out the same recipe in couple of Internet sites. 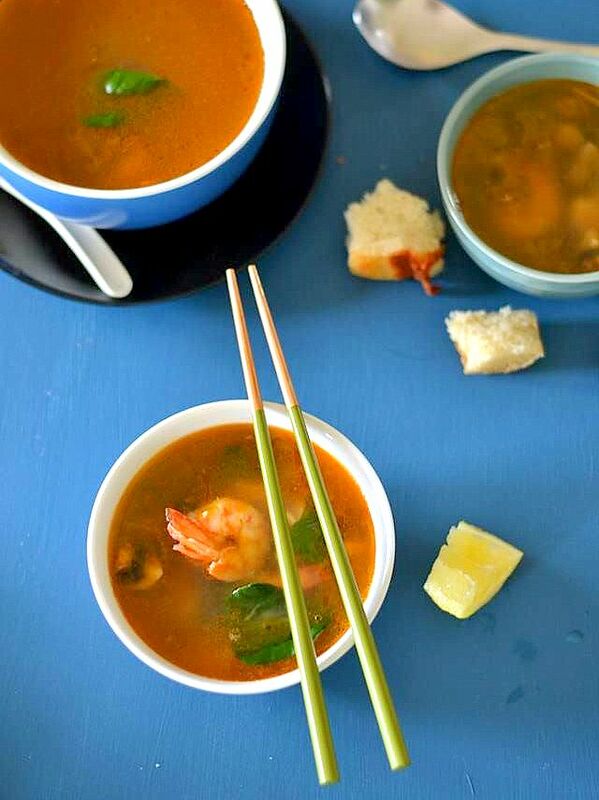 Tom Yum Soup, also known as Tom Yam Goong, is a very exotic and flavorful Thai dish. Goong in Thai means shrimp. This is one of the most loved and celebrated dish of Laos and Thailand, equally popular in other South-East Asian countries like Malaysia, Indonesia and Singapore. Today’s global economy helped to spread different Asian cuisines to other parts of world. So even in USA, wherever you live, would always find several good Thai restaurants nearby. The word Tom refers to the boiling process and Yam is a kind of hot and spicy salad. 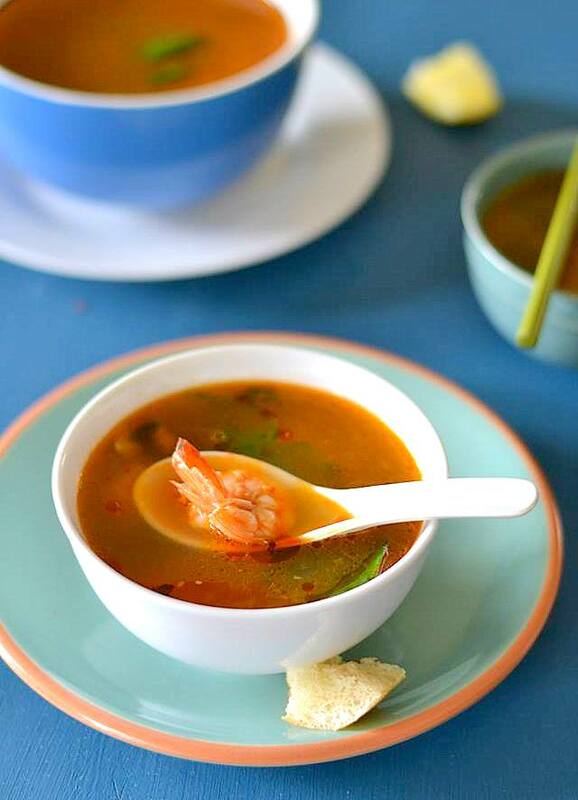 Tom Yum Soup is a spicy clear soup with a distinct hot and sour flavor, yellowish to reddish in color. It uses fresh Kaffir lime leaves, crushed lemongrass, chilies, prawns, lime, oriental fish sauce and chopped coriander leaves for garnishing. 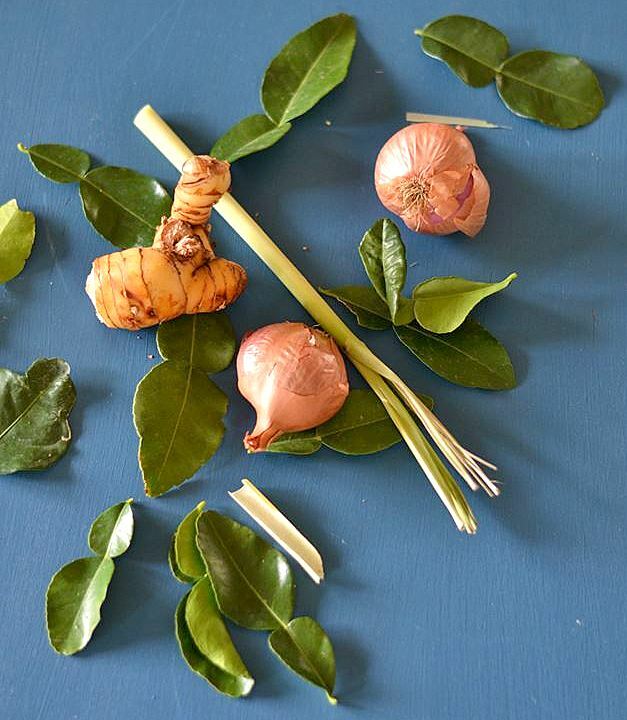 Kaffir lime leaves, lemongrass, galangal are natively grown produce in Thailand. Sometimes, you may add pieces of shellfish, pork, beef or chicken. You can serve this dish as a soup or along with noodles or steamed rice. It’s not only easy to make at home, healthy too. The ingredients are easily available at any grocery store. Recently I could find a local store where all the Thai ingredients are available. Chicken stock : 3 cups ( I used home-made chicken stock ) you can use store-bought one. Lemongrass - 1 stalk cut into 1 inch-long segments. Chicken Stock : If you want to make chicken stock at home, take a pressure cooker, add 3 and half cups water and add 1 lb big cut chicken pieces with bone. Let it cook over medium flame for 15 minutes. Then switch off the gas but don't open the cooker, let pass the steam automatically. Once it is done, Drain the chicken stock and discard the chicken. 1. Take a medium sized soup pot, pour the chicken stock. Add the shallots, lemongrass, galangal, kaffir lime leaves and bring to a boil. 2. Add mushrooms to the pot. Reduce the heat and simmer for couple of minutes. Add tomato,shrimps, fish sauce, chili oil and chili peppers(optional). 3. Cook until the shrimps turn pink. Switched off the gas. Add lemon juice and coriander leaves. Check the seasoning, adjust accordingly. Cover it and remove from the heat. Let the soup soak for 5 to 10 minutes before serving. 4. 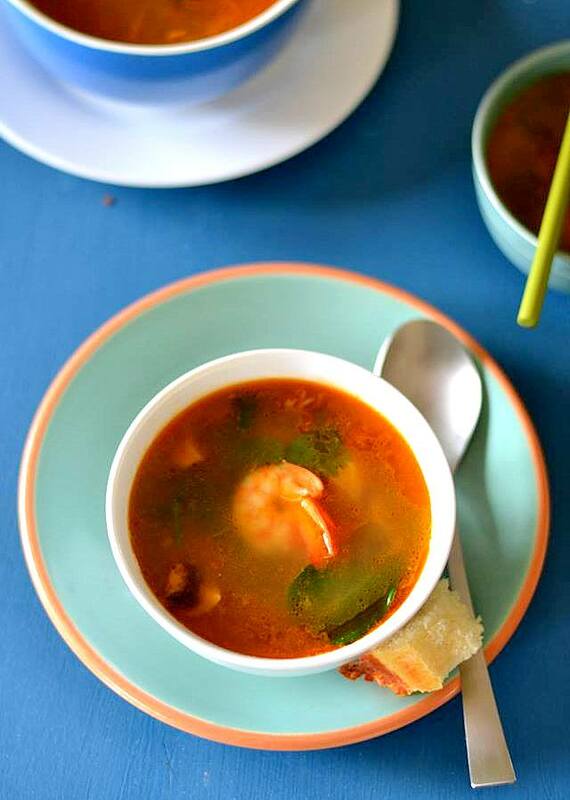 Tom Yum Soup is ready! Serve hot.